What do you get if you take a BBC Folk Award-winning singer, and a Mercury Award-nominated jazz pianist, and give them some new songs, plus one from a cheesy musical, and another from a Mozart opera. Perhaps surprisingly, what you get is a genuinely delightful EP that defies any clear genre categorisation. Josienne Clarke is well known around the folk scene, and with her guitarist partner Ben Walker they are stalwarts of the folk club and festival circuit. Their songs tend to the melancholy and doom-laden whether written by them or from the folk tradition of death and destruction. But Josienne manages to combine these with a charming personality and a dry wit. Kit Downes on piano, harmonium and organ, is one of the most interesting and unclassifiable jazz musicians of his generation. He has consistently shown his ability to hop between genres - playing standards, fusion, improv, blues and more besides. Recently he has been writing for one hand (following an accident to his left hand he wrote a new piece each day for right hand only – see this recent LJN interview ). He has also been touring a partnership with another folk musician Aidan O'Rourke, as well as his regular jazz partnerships. 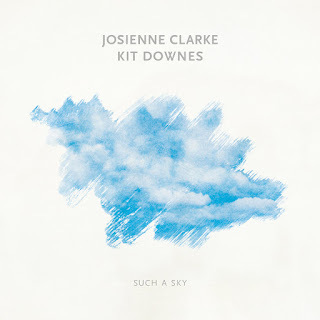 Josienne Clarke's voice would be quite outstanding in any genre. It may have only the subtlest of jazz inflections because she sings the songs fairly straight, but with far more emotional variation than most folk singers. Kit Downes accompanies in a sensitive and understated manner with occasional improvised sections. Josienne's four songs are all songs of longing and loss, the music haunting, and the words a bit mystical and poetic. The two surprises are an unexpectedly delicate version of Lionel Bart's Who Will Buy..? from the musical Oliver, and Susanna's aria Deh Vieni Non Tardar from Le Nozze De Figaro – rendered in English here as “Do Not Delay”. So what we end up with is a set of songs that are only loosely related to folk music, and equally loosely related to jazz. And yet the sum of the parts makes something utterly charming. It may even encourage jazz fans to explore the world of folk song a bit further.